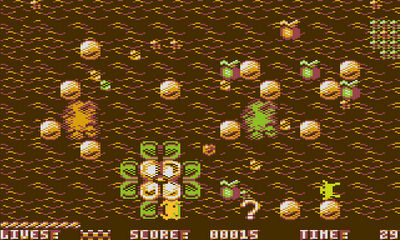 You start each single screen level with a frog placed in the top-left and bottom-right corners of the screen, with the rest of the arena full of hazards and collectables laid out randomly each game. Your goal on each stage is to collect all the green apples whilst avoiding the toxic brown ones, lilly-flowers, bugs, snakes and dragonfly. The lilly-pads provide a safe haven and the pebbles can be pushed around to block enemies, but with the bizarre control method this is a lot easier said than done. 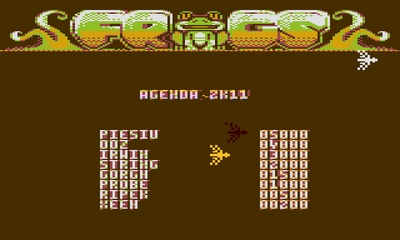 Maybe my brain just isn't wired up the right way, but whilst playing I found it impossible to keep an eye on what was happening to one frog whilst moving the other - and all to often I found myself completely cross-eyed, thinking that I was going to move one but actually controlling the other (which nine times out of ten resulted in instant death). Ultimately, after watching what must be a ninja-robot playing Frogs in the youtube video below and comparing it against my pathetic method of play (which involves frantically trying to get one frog on the lilly-pad and then attempting to collect the remaining apples with the other one), I think it's time for me to throw in the towel. To be honest, this game deserves a decent score in many respects because it ticks all the right boxes; it's an original game idea with great graphics and sound, marred only by what I can only describe as non-intuitive controls - not to mention the fact that it's just screaming out for a simultaneous two-player mode. Despite being a little difficult to see against the brown-coloured swamp background, the pondlife all seem to follow set patterns, the hearts are offered generously and in theory it should be simple enough to master. Quite possibly you'll have more luck doing so than me. 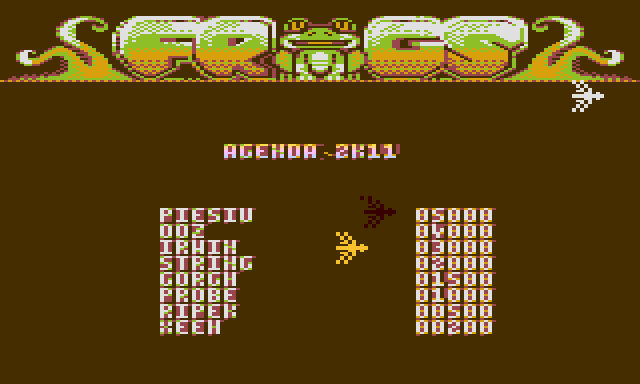 I know when I'm beat - and I have well and truly met my retro gaming Nemesis in Frogs. "Ninja-robot"- just noticed that :) , yeah xeen must be one of them. James- your abitilies are perfectly normal :)I just want you to know that. Everyone I spoke with had the same problems with the game.Thanks once again! hi. 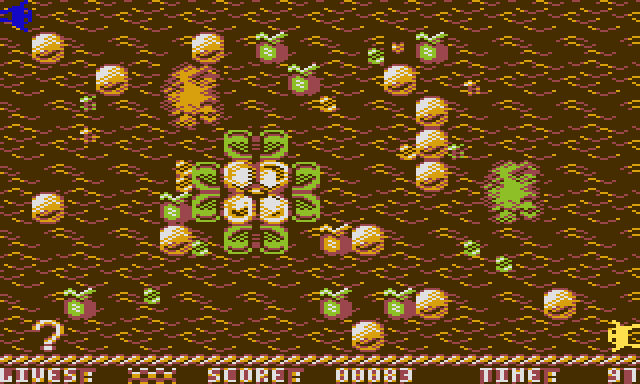 there is never version of this game (some more colours, 2 players mode, some fixes, easier). You just simply describe party version of this game.